Maus’ brother, Trevor, and sister-in-law, Robyn, visited us over the Easter weekend. Last year, they visited Great Britain for the Rugby World Cup and, as part of their trip, they visited Wales. We got talking and they mentioned that they had such fond memories of the Welsh cakes they ate while away that they decided to make some on their return home. I had never heard of Welsh cakes so I looked them up on the web. They are, essentially, little flat scones cooked on a griddle or in a frying pan. Of course, I wanted to give them a try. We looked up the recipe that Robyn had tried at visitwales.com. It looked pretty good but, that night, I took Elizabeth David’s English Bread and Yeast Cookery to bed to check out her Welsh cake recipe. I decided to try it so Trevor and Robyn could do a compare and contrast. Elizabeth’s recipe has a lot more butter than the recipe at visitwales.com (or any other recipe I could find, for that matter). It is a truly decadent amount. They tasted great but I think there may be a little too much butter for all but the butter-obsessed. With this amount, you most certainly do not need to serve them with any additional butter. They are very rich indeed. Elizabeth David described this recipe as typical but, for modern tastes, I am guessing a more typical butter-to-flour ratio would be that in the visitwales.com recipe. I might try it next time. These little guys would be perfect to whip up if someone was coming over for a cuppa and a nibble and you didn’t want to put the oven on. Give them a go. You will not be disappointed. Sift the dry ingredients (flour, baking powder & spice) together into a mixing bowl. Add the sugar. Cut up the butter and rub into the flour. Alternatively, put the dry ingredients and sugar into a food processor bowl and pulse a few times. Add the butter and process until the ingredients look like bread crumbs. Pour in the egg and mix by hand to form a dough. Use a little milk if the mixture is too dry. The dough should be the consistency of scone dough. I didn’t need to add any milk. Roll the dough out onto a lightly floured surface to about 1 cm thick. Robyn thought I left mine too thick. Elizabeth says they should be ½ inch thick. You decide but, remember, you don’t want them too thick because they will not cook through. Use a scone cutter to cut out rounds. Cook the cakes on a greased baking stone or griddle (or a lightly oiled frying pan) until golden. The heat should not be too high. The cakes need time to cook through without getting too dark on the outside. Test one after about 4 minutes on each side. Once cooked, sprinkle with caster sugar and devour. 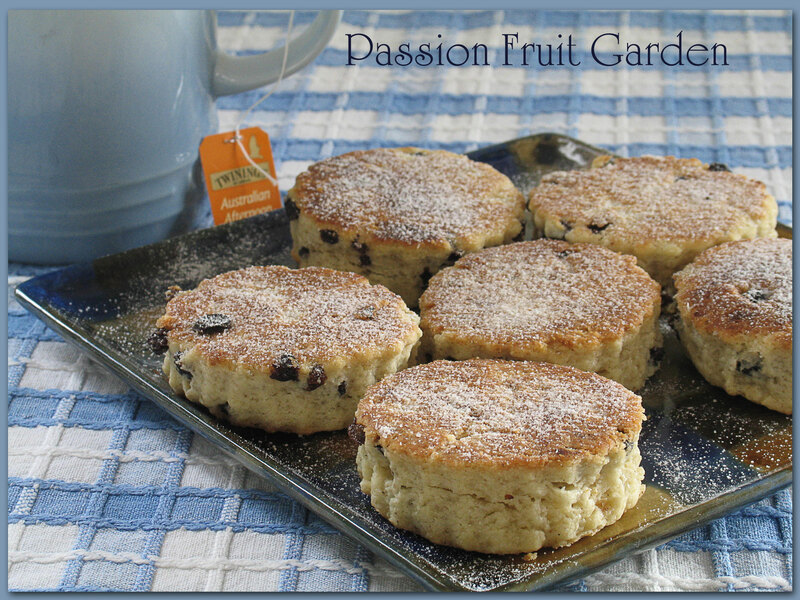 This entry was posted in Scones, Sweet Things and tagged Bakestones, Griddle cakes by Glenda. Bookmark the permalink. Hi Moya, Are you familiar with Welsh cakes? Wales is not so far from Ireland. These look great! I can barely get my normal scones to rise in an oven, let alone imagining anything rising on a griddle. I made a batch of scones during the week and they were once again a failure. One day…. one day…. Fiona, I don’t believe it. I think you are being humble. Never heard of Welsh cakes either – lovely take on a scone. Will definitely be giving them a try soon. They are so very quick to make – it is all good. Lots of bloggers have been consulting Ms David’s erudite Bread and Yeast Cookery Book of late, she definitely has depth and direction even if tastes have moved on from her recipes. Even my chestnut recipe came from Ms David. She knew her stuff all right. These are so delicious, Glenda… we enjoyed a good many of them in Wales last year. They’re on my list of good things to bake. Liz, I must go to Wales and try the real thing. These were pretty good but I can’t do a compare and contrast.